So, I decided to get rid of my Facebook. 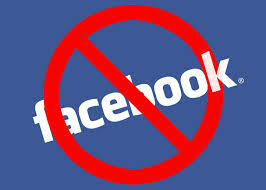 Both personal and shop Facebook have been deleted. Now, I didn't make this decision because I think Facebook is wrong, or terrible, or because I'm tired of the drama that I see on there. I've really enjoyed using Facebook for marketing and for social reasons. I also felt like I had spread myself to thin. Twitter, Facebook, Blog, Etsy--so many mediums that I am supposed to be using daily to interact with potential customers. One of them had to go. I felt like Facebook was the one that took up most of my time, and not just marketing time--personal time also, because I have a Facebook for myself. The time I was spending updating my corporate and personal FB accounts was not paying off--no customers, no deep relationships have been forged in the two years I had my Silver Moon Creations account. And honestly, once I started this blog I updated less and less. How I was using Facebook just felt so unnecessary to life, so I deleted it. Another reason I decided to get rid of facebook was the drama it was creating in my marriage. I almost didn't talk about this but its so relevant! When Mr. Adventure and I were married, he didn't have a Facebook, and hadn't had one for three years. He didn't want me to have one either, for a reason I couldn't fathom. I mostly ignored his requests to delete my account, and wrote him off as "one of those social-misunderstanding men" who just didn't understand the "wonderful reasons I used needed Facebook". We then decided to compromise and make my Facebook a joint account so he could participate also. For some reason through, I really disliked sharing what I considered "my" Facebook. Cue discussions like "why did you make my status say "Tacos"? Him: "Its our status. And we are eating tacos." Me: "You can't have a status that just says tacos!" To make a long story short, I finally decided it was in our best interest to just close down the account. Maybe one day I'll reopen it again; but when social media becomes an object of stress it needs to go.